In a city known for its steep, near vertical streets, walking up, down and around them to see the sights can be a workout. See it easily and see more of it on a Segway tour. 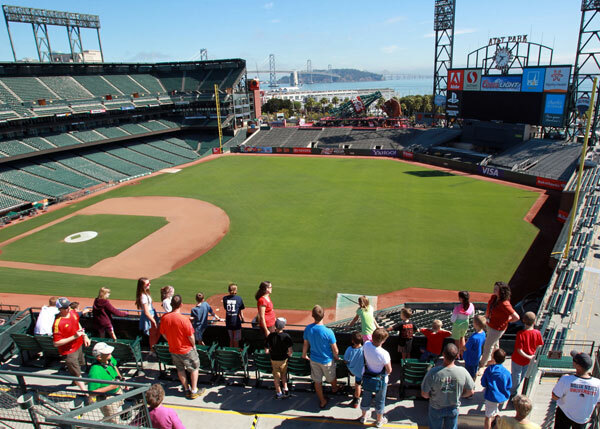 San Francisco Electric Tour Company has a super selection of guided Segway tours. While each tour is a totally different visual experience, they have a lot in common – all are fun, easy, safe, and the guides are great. Never ridden a Segway before? No worries. Training precedes every tour. Golden Gate Park by Segway is great for families. Gliding effortlessly along paved and unpaved paths for 7 interesting miles of the 1107 acre park meets everyone’s expectations. One of the largest urban parks in America, it was transformed in 1870 out of the sandy, barren “Outside Lands.” Now lush with trees and flowers, it’s chock-full of amazing places: California Academy of Sciences with grass on the roof; striking copper clad de Young Museum; serene Japanese Tea Garden; Conservatory of Flowers, historic Carousel. These are just the well-knowns. Guides know where all the hidden places are too. Want to see the city’s picturesque working waterfronts and wharves? Glide by famous Fisherman’s Wharf piled high with Dungeness crabs and Municipal Pier and Aquatic Park. See every kind of vessel imaginable: historic sailing vessels, fishing fleets, a WWII Liberty Ship, even a submarine. Take photos of Alcatraz and Golden Gate Bridge and, long after the ride is over, the scent of chocolate wafting from Ghirardelli Square lingers. Rocky, windy, wild and absolutely stunning, a walk along the trails of Lands End is a must do for anyone and any age. 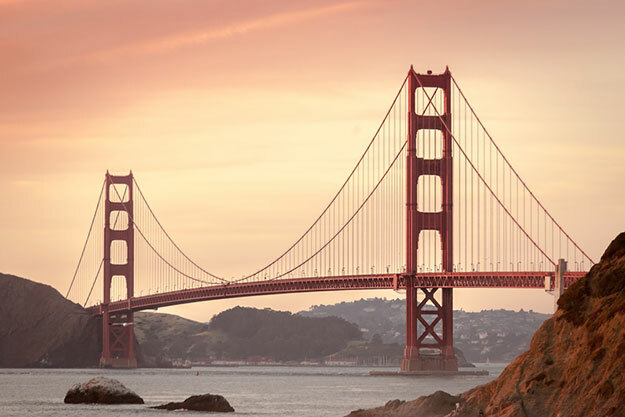 Jutting out on the very northwestern corner of the San Francisco peninsula, dramatic ocean views, beautiful natural landscape, ruins of bygone leisure, stunning views of Golden Gate Bridge, wrap-around beaches beneath the cliffs, and Marin County Headlands defy description. It has to be experienced. As part of the part Golden Gate National Recreational Area managed by the National Park Service, the entire area is well maintained and marked. Trails are mostly flat and easy. Steps up or down to access overlooks are a stair step workout, but doable for anyone who can manage stairs. So close, yet removed, from the density of San Francisco, the only real sound is created by waves rolling in from the great Pacific as they slam into rocks way below. Thunderous at times, the sound is rhythmically relaxing. Go where the trails lead; take in the natural splendor encountered along every curve and from every overlook. Ocean Beach below; Seal Rocks out there; Golden Gate Bridge looming large; China Beach and Bakers Beach in the distance. Watch the waves roll in and out over Sutro Bath ruins; walk along remnants of WWII era Battery Chester; see the Gold Rush era Point Lobos Lookout Station; have lunch with a panoramic view at Cliff House. Now hidden underneath massive Golden Gate Bridge, there are many reasons to visit this mid-19th century brick fort – the structure is impressive, the self-guided tour fascinating, the views from the top and the shoreline remarkable in the unique perspective they provide. It’s a totally different experience and not just for lovers of old forts. Open on Fridays, Saturdays and Sundays, there’s a lot to see, and its free! Although it never engaged in battle, the massive fort was built to as part of a strategic coastal defense network. Interpretive exhibits tell the story of the structure, how it was built, what life was like within the walls, and the building of the bridge. Walking through it is fascinating, and the National Park Service staff is available to answer questions as are volunteers in period costume. Every perspective is remarkable. Climb up stairs to the top for a spectacular eye level view of the bridge and of Marin Headlands in the distance. Map in hand, explore the fort from the water’s edge to the top of the fort. From ground level, looking up at the massive bridge foundation and cars driving overhead is awesome. Round out a great visit with lunch at nearby Warming Hut Café. Interesting, informative, and awesome fun! Bikers of all skill levels are welcome. If you are comfortable riding a bike and riding in an urban setting on bike lanes along bike paths, the great guides of Bay City Bike Tours do the rest. The ride with the biggest Wow! factor is the Guided Golden Gate to Sausalito tour – it goes over the Golden Gate Bridge! Get in shape for this spectacular, comfortable, 4-hour, 15 mile. It begins along the streets of San Francisco, cruising at a place that suits the group. Riding through San Francisco’s eclectic neighborhoods, the highlights, famous and not so famous, are seen up close. Having an interesting, fun guide leading the ride makes it special. Through their knowledge of historical facts and trivia, you see and learn so much. Biking over the iconic bridge is the thrill of a lifetime! On the Marin County side, quaint, artistic Sausalito beckons. It’s a lovely place to lunch, shop, and explore. One of the many nice features of this tour is a ferry ride back is included in the price. Head back after the tour or linger longer on your own, catching a later ferry back. It’s a spectacular outing! If this is not thrill enough, bike across the Golden Gate Bridge on Bay City Bike’s California Sunset Tour, a spectacularly beautiful coastal ride. Working its way up the shoreline, past the piers, past Fort Point at the base of the bridge and up and over the iconic bridge, seeing everything bathed in the colors of sunset, is special ride. If crossing the bridge is not your thing, choose Bay City Bike Tours’ 4-hour Streets of San Francisco Tour. It’s a fun, interesting ride, with stops for breaks, photo ops and lunch. Because the ride takes place in an urban setting with some hills, it’s not for kids 13 and under. Every first-time visitor to San Francisco quickly discovers that streets are steep. Some seem to go straight up. Word has it that streets were built straight up because they were designed in far away Washington with no regard for topography! Instead over going with the curvature of the land, they were all straight, which in San Francisco means straight up. These steep streets hold little secrets: steps and stairs, about 300 of these hidden gems, give access and shortcuts to those working and living on and around steep streets. Each stair or step is unique and has a name. Colorful foliage cascades over walls, interesting homes and gardens line the steps and out of nowhere, a spectacular view unfolds. Most stairs and steps, tucked away unobtrusively in residential neighborhoods, are visible only by the knowing eye. These quaint, narrow ones provide the only access “step people” have to their eclectic homes. Others grandly give access to popular public locations in various districts. Check out these: Lyon Street Steps, between the eastern edge of the Presidio and Pacific Heights. From the top, the view below is stunning – the Palace of Fine Arts, the Presidio’s green expanse dipping into the waters of the bay, and impeccably landscaped Pacific Heights mansions. Filbert Steps rise in 3 sections to Coit Tower on Telegraph Hill. It’s along climb, but the views, gardens, and architecture are fabulous. Nearby, Greenwich Stairs pass by handsome residences with pretty gardens. Climb up to Twin Peaks via Iron Street Stairs, the views are great. Vulcan Steps and Saturn Street Stairs are close to each other. Terraces with benches along the stairs, placed and tended by residents, provide resting stops with gorgeous views. One off-the-beaten-path steps is a work of art. Located in Sunset District, just east of 19th Street and a few blocks south of Golden Gate Park, Moraga Steps, aka 16th Ave. Tiled Steps, all 163 of them made of mosaic tile. There’s magic in these stairs. Do some research, climb the ones you like. For those who like a touch of extreme, Adventure Cat Charters Day Sail is great fun! On their sailing catamarans, the water is right there! For non-sailors, the bi-hulled catamarans are a really stable ride and having sails means there’s no engine noise. Two seating choices make it fun for everyone. Enjoy the ride, spectacular views and iconic shoreline highlights while comfortably seated inside the protected cabin where snacks, soda, beer and wine are available or, hang out on the huge netting stretched like a trampoline between the two hulls. The sensation of water rushing by underneath you is exhilarating! Sail around Alcatraz, silently eerie, and under the massive Golden Gate Bridge. It’s a great family experience – interesting and thrilling at the same time. Or, for a quiet, romantic time, go on Adventure Cat’s Sunset Sail. Following a route similar to the day sail everything is enjoyed from the comfort of the inside cabin. Glass of California wine in hand, take in the sun setting on the Pacific as it casts its golden glow before fading softly into night purples. For those who want a few more degrees of separation between themselves and the water, multiple large cruising vessels offer a variety of San Francisco Bay cruising experiences, some include a meal and sometimes dancing too. Red and White Fleet offers two ways to see the sights by water. 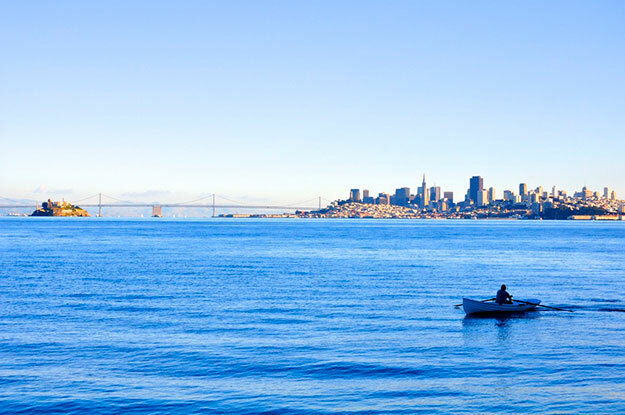 Their daytime Bay Cruise offers skyline views, shoreline highlights, a pass under Golden Gate Bridge and along Sausalito’s shoreline, a ride around Alcatraz, enriched by a choice of narrated audio tours in 12 languages. For a change of pace, see the sights in the glow of sunset while enjoying tasty finger food in the comfort of Red and White Fleet’s inside accommodations. Yet another option is a pleasant evening of lovely views, good food, and dancing on Hornblower Supper Club Cruise or their weekend Brunch Cruise, a mellow way to wind up a wonderful San Francisco visit. Another unique San Francisco outdoor experience lies on the outermost tip of the rocky jetty that encloses Marina District’s small harbor. It’s a must see, wave-activated art installation tilted The Wave Organ. Developed by artist Peter Richard and installed in collaboration with sculptor and stone mason George Gonzales in 1986, it has brought joy to locals and visitors ever since. The eerily lovely melodious sound is a phenomenon that comes the action of waves on the 2700 square foot installation of 25 PVC and concrete pipes curving up and out like periscopes set in granite and marble slabs from a Gold Rush era cemetery. As the waves slap against the installation, pushing water into underground openings, the rumbling, groaning and whistling sound of the sea is captured. Reminiscent of the calls of enchanted sirens and countless sea tales, it’s fascinating, haunting and joyful. Make your way into the rock alcove called the “stereo booth,” for sea sound in stereo. Or just sit and listen to the sea. Quack your way through a fun tour of San Francisco, first by land, passing by all the landmarks along the northeastern tip of the San Francisco Peninsula. It’s a raucous time! The Duck Captain leads the show, and a show it is! By combining history, sights, fun and catchy music, everyone rocks! This is why kids like it so much. They can see and learn while riding around having a grand time quaking like a duck and having a grand time. Next comes the sea part. The splash down is what everyone loves. As the splash down spot, McCovey Cove, comes into view, anticipation builds! It’s not just the kids who get a thrill out of riding a land vehicle right into the water where, after an entry splash, it bobs to a float and moves along quietly, engine in water mode. The cruise around McCovey Cove is unique. There are views along the eastern shoreline are good, but the most fun thing about McCovey Cove is riding right by AT&T Stadium, home of the San Francisco Giants. On game day, boats of every size and shape anchor out in McCovey Cove to “boat-gate” and enjoy the game! It’s a tradition. As the Ducks land back on shore, for the ride back to Fisherman’s Wharf, everyone wishes for more. For the kids, now thoroughly Ducktrinated, it’s a memory that will last a long time. So will the quacking! San Francisco’s quiet island gem is a delightful, laid-back change of pace from the high energy of the city. Located in the bay, just a short ferry ride out from San Francisco’s Pier 41 on the Blue & Gold Ferry, Angel Island is a pleasant outdoor destination filled with a long list of things to do – from active to sedentary. The island has great panoramic views and a fascinating history dating back to Coast Miwok and Spanish explorers. It was an immigration processing station and has over 100 years of military history. Now a California State Park, it is open year round, however most activities are available only from April through October. In season, there’s much to enjoy. Trails lead in different directions. Perimeter road is an easy 5-mile hike around the island. A 2-hour guided Tram tour goes around Perimeter Road too. Guided Segway tours are lots of fun, and bikes and electric scooters are available to rent to explore on your own. A pleasant café and cantina with outdoor seating and good food is great for lunch and the cantina becomes a happening place with live music every afternoon, June – August. To top it off, the moderate level 2 to 2.5 hour hike up 781 foot Mount Livermore rewards those who make it to the summit: breathtaking 360 degree views. Note: Reservations for the ferry trip and activities must be made ahead. Contact the park directly for information, camping and specialty tours. Ferry Service information is on the park website as well as the website of Angel Island Company, which manages most of the tours and the Cantina and Café. There’s something to be said about simplicity. A slide down Seward Street Slides fits the bill. It’s a fun, urban, uniquely San Francisco outdoor activity for families with kids. And, it’s free! Sliding down dual, long, curving concrete slides on a piece of cardboard at Seward Street Minipark is a blast! Located between Seward and Douglas Streets in the Castro District, it’s a bit out of the way, but easy and fun. Maintained by the city parks department, it’s only open Tuesday through Sunday from 10am – 5pm. It’s a fast, thrilling ride, but not for toddlers. Go for a slide! All you need is a piece of cardboard and you’re off!